Tallahassee mayor and the Democratic candidate running for governor of Florida Andrew Gillum. Credit: Facebook via Gillum campaign. (September 27, 2018 / JNS) Tallahassee Mayor Andrew Gillum, the Democratic candidate running for governor of Florida, has associated with the radical left-wing group Dream Defenders, whose founder, Phillip Agnew, has ties to Ahmad Abuznaid of the U.S.-designated terrorist group the Popular Front for the Liberation of Palestine (PFLP). This development comes amid Gillum’s opponent, Rep. Ron DeSantis, attacking the Democrat in a TV campaign ad for having “anti-Semites around him,” such as welcoming the Council on American Islamic Relations (CAIR) during the Florida Muslim Capitol Day in 2016, an annual gathering of approximately 200 statewide Muslim leaders and activists. Four years beforehand, Gillum wished Abuznaid, a co-founder of Dream Defenders, a happy birthday on Facebook. During a Democratic gubernatorial primary forum, Gillum gave a shout-out to Dream Defenders, citing their demonstration at the Florida State Capitol building in July 2013 in response to the acquittal of neighborhood watch coordinator George Zimmerman in the 2012 shooting death of 17-year-old African-American Trayvon Martin. “And I hope you keep at it, good luck,” he added. The accusations against the Gillum come as the race for governor of the key battleground state heats up as the November elections near. According to the latest RealClearPolitics average, Gillum has a 4.5 percentage point lead over DeSantis in a state with a high percentage of Jewish residents. The campaign has also drawn national attention. 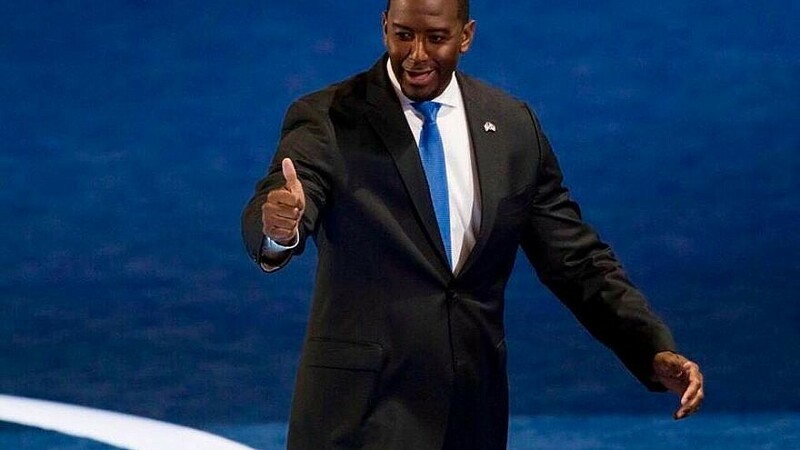 Gillum has been the favorite of progressive wing of the Democratic Party backed by Vermont Sen. Bernie Sanders, while DeSantis, a three-term congressman and Iraq War veteran, has been a fervent supporter of U.S. President Donald Trump, who has strongly backed the president’s pro-Israel record. However, the DeSantis campaign has made headlines as well. The candidate has been accused of accepting $20,000 from a pro-Israel Republican donor who tweeted that President Obama was a “MUSLIM n*gger.” Although the campaign denounced the rhetoric, it returned all but $2,000 of the contribution. Meanwhile, controversial left-wing megadonor George Soros, who has funded anti-Israel groups such as Breaking the Silence , B’Tselem, Yesh Din and al-Haq, has contributed $1.2 million to Gillum’s PAC. The Dream Defenders, founded in 2012 and whose members volunteered and fundraised for Gillum’s primary campaign, advocates for the anti-Israel narrative, including the BDS movement, exemplifying the trend of black anti-Semitism in the United States. During a January 2015 trip, Dream Defenders met with Omar Barghouti, founder of the BDS movement, and Diana Buttu, who served in the Palestine Liberation Organization during the Second Intifada in the early 2000s, when the PLO perpetrated attacks against Israelis on buses, and in restaurants and other public places. The delegation also met with artist Ayed Arafah in the Dheisheh Refugee Camp, which is recognized as a PFLP camp. However, a Gillum campaign spokesman accused the DeSantis campaign of desperation in its latest attacks. “There Ron DeSantis goes again, lying to voters in a desperate attempt to save his campaign,” a campaign spokesperson told JNS. “Ron DeSantis is running from his record of voting to take away pre-existing condition protections for Floridians and more devastating revelations about his campaign’s troubling ties to white supremacists and neo-Nazis. This latest development surrounding Gillum has earned scorn and push back from some pro-Israel groups and individual members of the American Jewish community. The Middle East Forum’s Oren Litwin told JNS that Gillum’s connection to the Dream Defenders cannot be ignored. However, electoral analyst Nathan Gonzales, editor and publisher of “Inside Elections,” told JNS that Gillum could win despite his labels. Neil Strauss, the digital director for the Republican Jewish Coalition, told JNS that Gillum is enabling hate through his support of Dream Defenders. Ron Klein, chairman of the Jewish Democratic Council of America, told JNS that despite the Dream Defenders’ anti-Israel activism, Gillum supports the Jewish state.